I Will Submit your Websites 10 High-Quality Permanent Forum Backlinks. Forums are the Best Way to get High-Quality Traffic on your Website and Very Important for Google Rank. This Process 100% Manually White hat & Spam free Submission No robots used. After submission, I will send you an excel file or screenshot with all links or current status of a submission, username, and detailed report. Please message me before ordering, if you have any query! 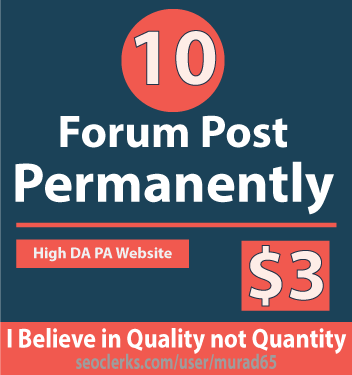 Forum Post Permanently | 10 Forum Post 100 Percent Workable Service no Spam is ranked 5 out of 5. Based on 2 user reviews.